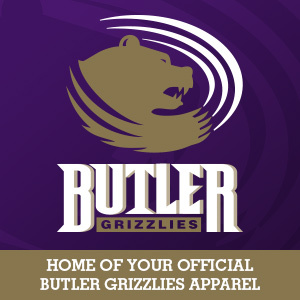 Purple and white plaid flannel pants, "Butler Grizzlies" and the Grizzly power head embroidered on the upper left front. 100% cotton. 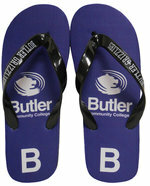 Black cuffed sweatpants with side slit pockets and back pocket, "Butler BCC" imprinted in white on the left front. 55% Cotton 45% polyester. Fashionable flip flop with 15mm lightweight yet durable sole and vinyl straps. Sizes accommodate women's size 4 & higher and men's sizes to 14. Made in the USA. Size: XS, S, M, L, XL - all unisex. Black pull-over hooded sweatshirt with a front pouch pocket, "BUTLER" imprinted in purple across the upper front. Therma-fit design helps keep you warm and insulated. 100% polyester.